Inspired by the owner’s preference for a sleek, modernized interior and a flair unique to his tastes, Duncan Aviation Senior Designer Mary Lee transformed the interior of this Bombardier Global Express from its traditional, outdated neutral environment into one of contemporary luxury. In order to capture his vision of a sporty yet sophisticated environment, the design concept began by incorporating blue carbon fiber and silver metallic painted cabinetry in place of traditional wood veneer. 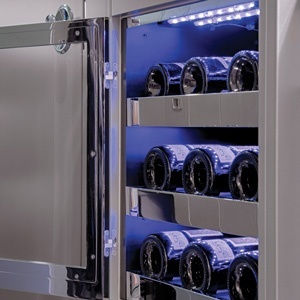 After walking up the Duncan-Aviation-designed stainless and neoprene entry steps, you see the first stunning feature: the custom blue LED-illuminated wine cabinet. 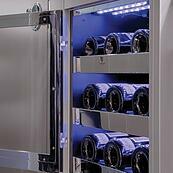 The owner’s passion for fine wines and gourmet cooking became an inspiration for the final galley design. As you watch the video below, note the unique features and details throughout the aircraft. The angled touch-screen bezels and chrome inlays, for example, were designed and manufactured by our in-house fabrication team. The blue LED-illuminated cup holders are also an exclusive Duncan-Aviation design and were incorporated into the drinkrail to complement the ambient blue floor lighting. The blue carbon fiber served as the unifying element to achieve balance throughout the cabin and the focal point on the bulkhead dividers. If you would like to see what this Bombardier Global Express looked like before this transformation, read the Fall 2016 Duncan Debrief article. 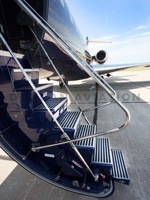 Unique Global Express Step Tread: Take Two!! When something this good becomes available, operators take notice. 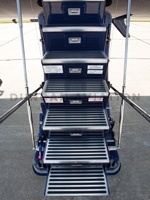 In the spring of 2016, we designed and fabricated a new and innovative step treatment for a Bombardier Global Express airstair. You can read more about R&D process here. It didn’t take long for the word to spread throughout the industry about the new stainless steel treatment available for most Global operators. So much so, operators are beginning to contact our team of professionals to discuss options for their aircraft. Well…we did it again, but this time in blue! As soon as she showed him the detailed presentation sheet, he was hooked. Duncan Aviation’s Fabrication Shop has talented team members who love to meet challenges like this. Bryan Hart, Fabrication Shop Team Leader, based the original concept and design on nothing but a few pictures sent by email. 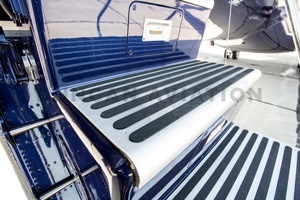 After considerable research they found the perfect materials, conducted required tests, and were soon able to present a sample to the customer that had the brushed stainless and neoprene accents they had envisioned. The results speak for themselves. 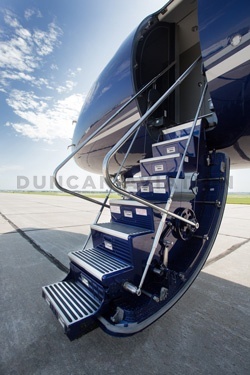 To see more unique interior and paint solutions by Duncan Aviation, visit www.DuncanAviation.aero/gallery.